You're probably reading this blog from your smart phone right now. 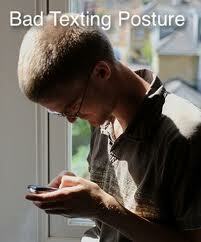 Stop and take a minute to evaluate your posture. Chances are you are slumped with your shoulders rolled forward and your head hanging down, staring at that little screen somewhere around your navel; kind of like the pictures below. Is your neck hurting right now? If not, it will. People are on their smart phones more and more these days; waiting on line at the market, standing in an elevator, or catching up on their TV shows during their lunch break. We're texting, surfing, watching movies, and emailing constantly throughout the day. In the last couple years I have noticed an increase in the number of patients complaining of neck pain. I will never forget the day I came out to my waiting room and saw a family of four all slumping in their chairs bent over their respective handheld devices. Want to guess what I was treating the parents for? Lucky the kids were not yet complaining of neck pain. I always tell my patients that the best chiropractic or acupuncture treatment will do very little if you keep going back to doing what your were doing that brought you here in the first place. In addition to treatment, I instruct my patients that when using their smart phones they must lift the device to eye level, roll their shoulders back and down, lift their chest, and avoid a protruding chin. This posture keeps the neck in a much better position and will minimize strain on the muscles, tendons, ligament, and discs. 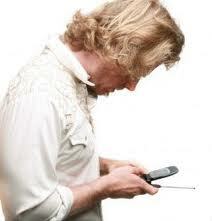 It's possible that for some people, adopting this posture will completely eliminate their neck pain. If you have any questions or comments on this or any other blog entry I can always be reached by email at DrGordon@ACSCLA.com. Keep moving!